Teampass uses 3 roles of possible Users. An Administrator can perform any kind of operation in Teampass except working on Items. The Administrator is often a member of IT team. Notice that the Administrator has not access to the Items with his "administrator" account. manage Users (modification and deletion) on which he is defined as "main administrator"
A Manager could be a Team leader. A Human Resources Manager in Teampass has the same rights as a Manager but he can manage all Users independately of his/her group. Notice that he will be also promoted to Manager role, and that he will not be able to edit existing administrators. A User is a normal Teampass user which deals with Items in the way defined by the Administrator and Manager. 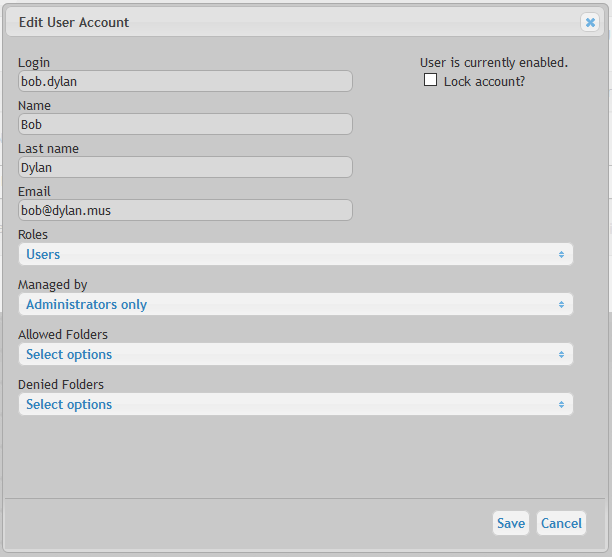 Access to the Users Management page. Name, Last name and Login need to be filled in. The Password is the one the User will need to use to get connected to Teampass. Email is used to some specific feature of Teampass. User is administrated by setting is important. By default, Administrators will manage the Users, but you can also decide that this management could be delegated to the Manager of a Role. In this case, select the Role manager. 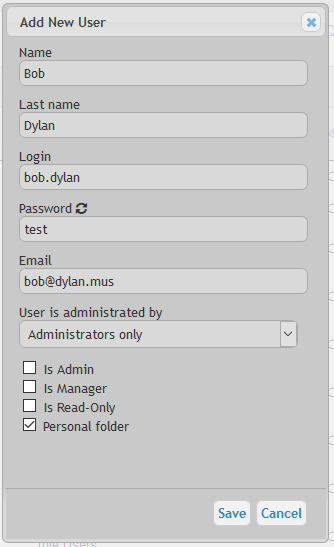 Next 3 settings Is admin, Is Manager and Is read only are related to the permission of the User inside Teampass. If Personal folder is ticked, then the Personal Folder for this User will be created. If Create folder and role for *** is ticked, then you can imagine what will happen. The new User is now added to the list. You now need to associate this new User to one or more Groups. Click on the Edit icon at the left of the User. Perform the change you want on this User using the dialog box that appears. Managed by field permits you to select what Manager (or Administrator) will manage this user. Each user is associated to Groups. This means he/she can access the Folders defined through the Group. Nevertheless you can decide to allow this User to access other Folders than the one allowed by the Group. For this, you need to use setting Allowed Folders. You can also decide to restrict the access to some Folders using the setting Forbidden Folders. This should be very rare and for specific case. If it is regularly used, you should think about arranging your Roles. For some reason, you could need to lock a User. This will prevent the User from connecting to Teampass. You can only delete a User that has been previously locked. For this, tick the corresponding checkbox and save. To unlock a locked User, tick the corresponding checkbox and save. You can change the User level by using the selectors. Using the selectors, you can quickly perform the following actions on a User.